21st Century Fox's 150,000 square foot headquarters now have a 100% open floor plan to encourage wellness and accessibility in the workplace all while incorporating displays of the mass media company's story of success. Gensler was engaged by mass media company, 21st Century Fox, to create the renovation design for their headquarters located in New York City, New York. 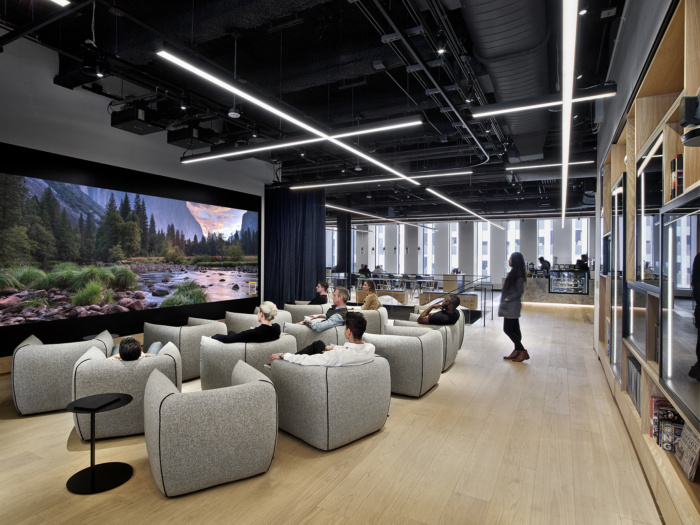 In a redesign of 21st Century Fox’s headquarters, Gensler transformed their office space into a highly collaborative environment, refocusing the company’s efforts on the employee experience and the media giant’s content creation. The workspaces —comprised of three floors at 1211 Avenue of the Americas — feature a 100% open plan workspace, enhanced employee amenities, and unique display moments that celebrate the story of 21st Century Fox. Formerly sequestered in individual offices, the workplace was transformed to be accessible and transparent, altering the client’s self-perceptions and activating the workplace throughout. With teams previously spread across various floors, Gensler’s design promoted fluidity and connectivity as they implemented numerous collaboration settings within the work neighborhoods. For executive and senior management spaces, Gensler flattened the hierarchy by placing popular gathering spaces and amenities adjacent to their open offices. At the entrance of each floor black steel accents, oak floors, concrete walls in wood grain molds, and linear lighting set a contemporary yet warm tone. Branding moments highlight typography and text to emphasize the company’s narrative tradition. Graphics subtly reflect the company’s searchlight icon. The executive floor features a central plaza with three destinations to activate and energize its space. A gallery space of frame-lit glass cases holding movie props, costumes, and archived collections showcases 21st Century Fox’s film and TV history, across entertainment, sports and news. It hosts integrated social and collaborative areas. An open screening space, the focal point of the plaza, invites employees and clients alike to enjoy visual content and attend private screenings. Ornamented with blue velvet dividers and rounded graphite lounge chairs, the screening room is accessible and inviting as it generates a buzz and energy. The northern section of the plaza features a food and beverage venue with a Stumptown coffee bar and chef’s table where sushi and specialty meals are prepared in full view. Beyond, workstations with sit-stand desks are situated in a 100% open plan to promote both wellness and accessibility. Executive spaces include open shelving partitions and exhibits of heritage assets from TV and film, continuing the theme from the main gallery. Exposed ceilings were sprayed with acoustical material and large domed lighting fixtures made of felt were installed to capture office noise. Boardrooms reflect the metropolitan environs with concrete slab tables and shelves, natural oak, and black steel accents. The three floors are connected by a glass-framed concrete staircase with herringbone-slatted wood underneath. Grab-and-go cafes, exhibition cooking stations, and a food hall are interspersed on the multiple floors creating a cross-pollination of company divisions.